A well designed bespoke staircase can become the main feature of any space whether it is in a residential property or a commercial building. By utilising the natural strength of a metal internal structure, the staircase can be visually spectacular with endless design posibilites. With a steel core structure, a set of spiral stairs finished in wood or stone can be the main feature of any house of building. HDM have experience with multi-million pound projects and are proud to say that in most cases the finished stairs are usually the stand out item of the property. Arguably one of the most impressive types of staircase design, by creating an extra strong connection inside the wall and floor finishes and by making the internal strength of the treads even stronger than normal. HDM are able to create the illusion of a gravity defying design, where the treads simply float. 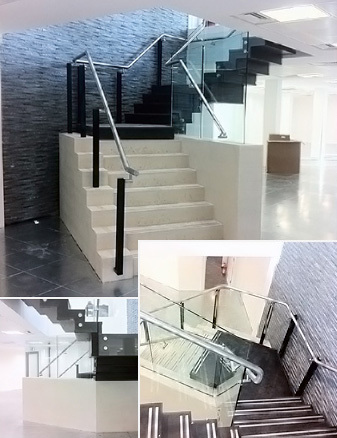 This type of staircase finished with architectural glass balustrades can be a stunning design feature. A very popular minimal design well suited to external lightwells and access stairs. Open tread stairs allow light into a space that would otherwise be darkened by a close tread design, whether you require a durable steel tread for external stairs or a timber or stone clad open tread, HDM can offer you the perfect design solution. 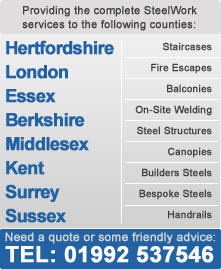 Cost effective and durable staircases for access to mezzanine floors and platforms formed from sturdy checker plate and made to measure, fitted with modular balustrades and handrails and conforming to all BS safety standards.